Lewis Avenue Bridge : Adams & Smith, Inc. 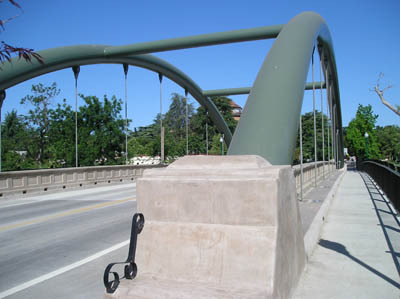 The Lewis Avenue Bridge in Atascadero California, a $6.2 Million suspension bridge, was built to link downtown Atascadero to a new retail center. The retail center and bridge were considered vital to the revitalization of the Downtown of the city and the projected increase in tax revenues for the city topped $300,000. 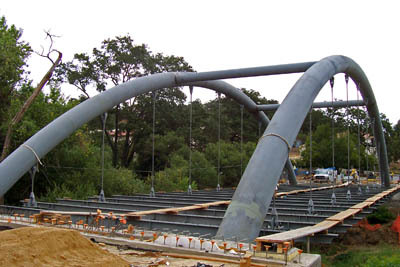 The “Tied-Arch” bridge spanning the Atascadero Creek is held up by two 42″ diameter steel pipes from which cables suspend supporting the bridge structure. With a unique look and the highest quality of construction Adams & Smith is proud to have furnished and erected the steel for a project that had a major impact on the city of Atascadero and surrounding areas.